Last Saturday, we were invited by San, in conjunction with Fraser Centrepoint Malls, to a Smurf-painting event at Northpoint Shopping Centre (the same place we visited just a month ago). The organisers gave us picnic mats together with our painting supplies such as acrylic paints and paint brush. 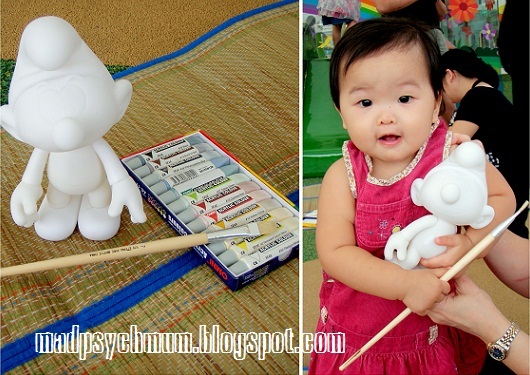 Although I knew that Girlee was probably too young for it, I thought I'll get her to try it out and see how she'll take to painting. I was seriously hoping that she would show some promise of becoming the next Vincent van Gogh (minus the depression) or at least display some evidence that she has inherited some of mummy's artistic talent and creativity. At first she did show some promise. 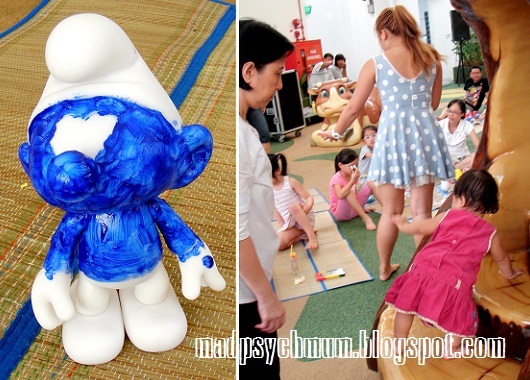 She patiently sat and held on to the brush as she stroked it up and down on the body of the Smurf figurine. But after just painting half a Smurf..
..she gave up and clamoured to walk around the playground (with help from her grandma), leaving mummy to finish the rest of it by herself (but seeing as there was little point in continuing, I decided to finish the rest of it at home instead). 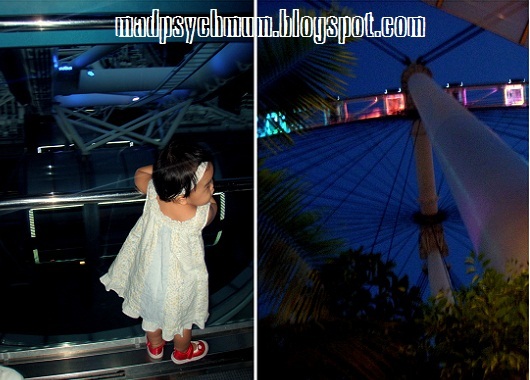 The next day, we visited the Singapore Flyer for the first time as my mother had managed to get really cheap tickets for us. I was excited as almost everyone has been on it except us. We were taken into the preflight gallery, where they took the theme of flight just a tad too seriously. Just like at the airport, all visitors had to pass security checks before entering the gallery. I have no idea why but it wasn't really a hassle so we just did it without complaint. The preflight gallery was decorated like the halls of the airport just before you boarded a plane and displayed information about the Singapore Flyer just like a museum. The light-emitting pointer at this particular exhibit was also short enough for Girlee to play with, which I thought was really thoughtful. The gallery then ended with a corridor leading to the platform where we were to board the Flyer. You have to board while the capsule is still moving so remember to watch out for your kids when doing so. Baby girl had the time of her life on the capsule! She was holding onto the railings, looking down at the scenery (with no fear of heights what-so-ever), walking around (with help) and taking lots of pictures. "Look at all the cars baby!" To be honest, it got quite boring after a while as the scenery remained the same. 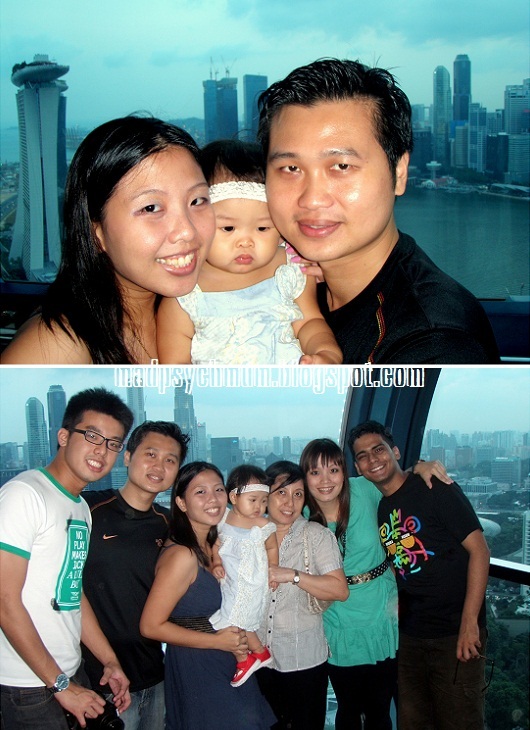 The hubby also felt the skyline looked better from the top of the Marina Bay Sands. 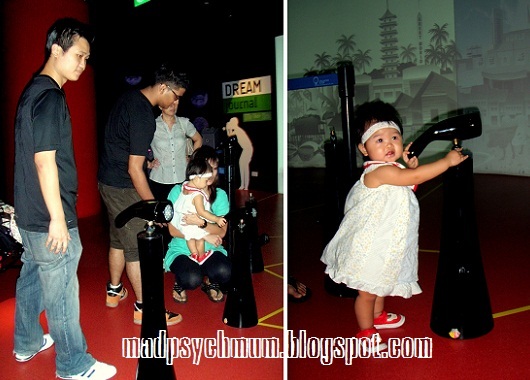 The only one who truly enjoyed the experience the most was baby girl! 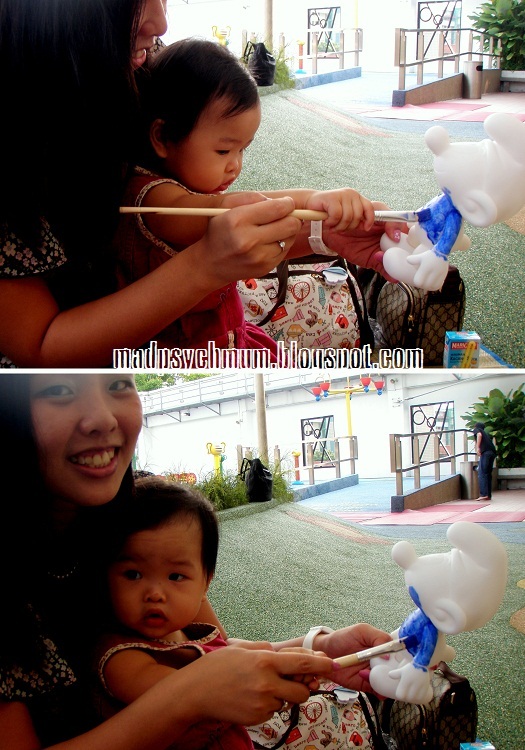 As you can see in the pictures (where she looked away most of the time), she was more fascinated by the outside scenery than taking a photo! The sky was still bright when we boarded the capsule but as the sun set while we were still in it, the sky turned dark by the time we reached the end of the ride. It was a great weekend for both baby girl and I! Hope you had a great weekend too!